Home > The Museum > Press > New exhibition space "mNACTEC Treasures"
New exhibition space "mNACTEC Treasures"
The National Science and Technology Museum of Catalonia (mNACTEC) has opened its new permanent exhibition space mNACTEC Treasures to the public, showing off the Museum's heritage collection through a contemporary presentational discourse. The aim of the new space is to show the artefacts from the various collections of the mNACTEC through an innovative idiom, based on technology and emotions. The tour of the mNACTEC Treasures space takes some 25 minutes, and is conducted in groups of 30 people. The content is available in three languages: Catalan, Spanish and English. 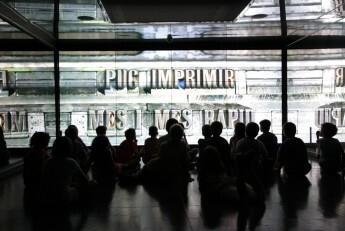 The session is staged in an open space with mirror-lined walls, and includes: an introductory audiovisual presentation about the themes on display, projected in a video mosaic format on 12 screens; the unmasking of the objects on display in the cabinets that appear behind the mirrors, and experimentation with a virtual simulator, reproducing an Underwood typewriter. The supporting technological partner for the space is Panasonic. The first exhibition to be presented in the new space is "Typewriters", which will be on view until October 2017. It represents a conceptual and visual narrative addressing mechanical writing, with the emphasis on the evolution of typewriter technology. The mNACTEC Treasures space will be permanent, but is intended as an exhibition undergoing annual renewal, with the objects and the audiovisual show being replaced, while reusing the presentational approach and technological equipment. The next two themed exhibitions planned on this same platform, combining technological evolution, individual sensations and collective social impact, will focus on sound recording and reproduction (2017), and on coffee and coffee makers (2018).